Seated Liberty dollar values year after year move higher and higher. Today the minimum value for a coin in "Good" condition is over $210. Find an 1851 or 1852 in your group and the excitement really begins. Your coin would sell at auction over $6,000. It is always thrilling finding a rare date but it is not the only way to higher value. A nice condition or a better "Grade" coin moves the value up into the two or three hundred dollar range. The Uncirculated Seated Liberty dollar pictured is a treasure any collector would find exciting to own. The value is over $1,250 in such nice condition. Look for rare dates, yes. Also, the state of preservation is very important. 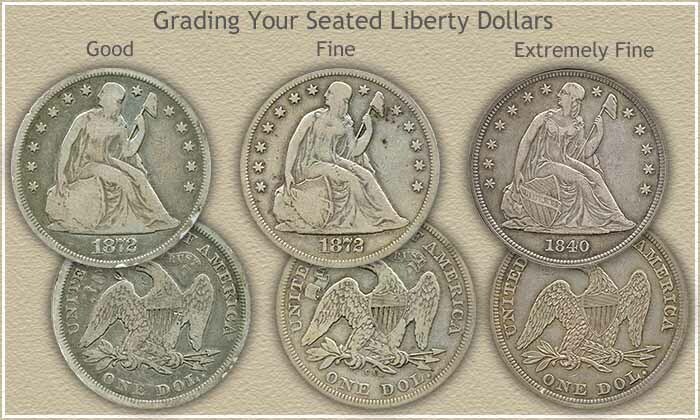 See more about "Grading" the condition of your Seated Liberty dollars below. The following chart shows Seated Liberty Dollar silver values are worth a close look. Carefully assess each one you own. Produced in small quantities and unfortunately with low survival rates from so long ago. The situation today is few coins are available to meet the demand of collectors. For additional reference... NumisMedia publishes an extensive fair market value price guide, covering the retail Seated Liberty Dollar Values in detail. Small mintages, extreme age and very popular with collectors, all adds to Seated Liberty dollar values. Collectors are always looking for better condition coins. Each is examined very carefully for wear, bumps and abrasions. The overall look and appeal is assessed and a "Grade" is determined. Often a large increase in value accrues from one grade to the next higher grade. Carefully examine your coins and compare them to the grading images below. Look closely at the letters of LIBERTY on the shield. All letters showing, separates a coin in "Fine" condition from the lower grades. Note: It is not uncommon for some letters to show weakly across the tops. If your coin is sharp and crisp in detail with just light wear, it is in "Extremely Fine" or better condition. A very desirable coin. Sometimes the difference between grades is subtle. If your coin approaches "Uncirculated" condition the change in Seated Liberty dollar values is not so subtle. Finding better condition coins happens more often than finding rare dates. If you believe your coin is a higher grade and value and not sure, help is available. Check a few rare coin dealers listings, look for those offering Liberty Seated dollars similar to yours. Their listings and prices usually include a notation of the NGC or PCGS assigned grade. Additionally, these coin dealers are potential buyers of your coins. 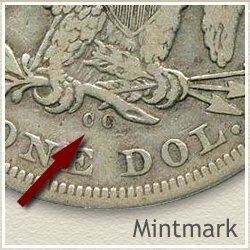 Certain mintmarks increase Seated Liberty dollar values. The "CC" mint mark jumps out as the rarest, minimum value $850... and of course the favorite of dealers and collectors. Branch mints placed a small letter on the coin indicating where it was produced. The New Orleans mint used an "O", San Francisco an "S" and the Carson City mint a "CC" mint mark. They are located on the reverse just under the eagle. Wow, every Seated Liberty silver dollar in Uncirculated condition is worth over one thousand dollars. Collectors today are proving if it is the right coin, they are willing to pay for it. How high can the value of silver dollars go and what should you do? Consider your group of coins as the beginning of a coin collection. The start of an enjoyable and rewarding hobby. If that is not for you, one successful approach is to sell all your coins and use the proceeds to buy one nice rare coin. Exchange your circulated coins for one nice Uncirculated coin. Pass the thrill of a rare coin on to your children. Your coins are in strong demand. The values are strong. The future is bright and Seated Liberty dollar values are sure to continue advancing. Keep in touch. Check back here when curious about values. Print the Coin Values Worksheet - link in navigation column - to list your Seated Liberty silver dollars and record their values. Should you decide to sell... use the worksheet as an invoice and packing slip when sending coins through the mail to dealers. It indicates you have done your coin values homework.